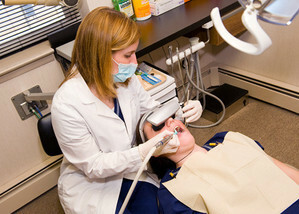 Dentist in Ambler, PA – (610) 279-0363 - Danelle C. Fournier, D.M.D. Because we’re strong proponents of patient education and positive patient outcomes, we’ll take as much time as needed to answer your dental questions and offer tips to keep your teeth looking and feeling their best. Our top priority is your comfort so we offer DVDs & movie goggles in our exam rooms. "I think you all know what I was looking for in dentist. Someone who could best replicate my prior, retired dental caregiver! How did I know that I would find someone who is so caring, friendly, competent and professional? Dr. Fournier was patient with me (no pun intended) when I dragged my feet about having extensive crown work done. When the time was right and I gave her the "green light," she made the experience so painless, stress-free and much better than I had anticipated. Moreover, the finished product was fantastic! I get compliments all the time on my new smile and have Dr.Fournier and her staff to thank for that. I have consistently recommended Dr. Fournier to friends because of the warm office environment and the excellent dental care she and her staff provide." We’re only about 10 minutes from Ambler!